Is Beyoncé the New Princess of Thailand? According to a collection of creeper shots, the couple has spent their time in Thailand enjoying a Muay Thai boxing match, moped jaunts around town, elephant rides and attending an awkward-looking New Year's Eve party. Recently, photos have surfaced of Beyoncé wearing a rather regal-looking headpiece and a beautiful blue chut thai—a formal Thai national costume. You will also notice that Blue Ivy is wearing a tiara as well. Now, you might be thinking: But Jay Z is dressed like a hungover frat bro. This proves nothing. You would be correct about the first concern, but I have an answer for the second. Just a few weeks ago, Thailand's Princess Srirasmi abdicated her title. In doing so, she has essentially divorced her husband, Prince Maja Vajirahlongkorn. That means, that Thailand has a prince, but no princess. This theory is further strengthened by the prophacy of one Mindy Kaling, who, in an episode of The Mindy Project just so happened to give herself the warrior name, "Beyoncé Pad Thai." Could this simply be a series of completely unrelated coincidences? 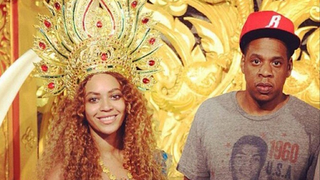 Might Beyoncé just be enjoying her vacation and embracing the culture of the country she's visiting? These are all possible answers. However, with evidence like this, we simply cannot discount that possibility that Beyoncé Giselle Knowles-Carter might actually be the new Princess of Thailand.